I've been living in DC for almost three months now, and I've got another two and a half to go. I really do enjoy my fully-furnished apartment and it's location here in the Arlington area. I've got easy access to all of the local shops and restaurants I could want, and it doesn't feel like I'm trapped in a maze of concrete and asphalt. Because of the temporary nature of my stay in DC, I've been reluctant to decorate my apartment and make it truly "homey," if you will. I haven't really hung anything on the walls because I'm not sure to what extent I'm allowed to do that. I mean, I'm sure I'm free to do so, but I don't want to run the risk of paying some exorbitant fees/fines for putting a few holes in the walls, when I know I'm leaving soon anyway. I wish now that I had gone ahead and bit the bullet and hung stuff up. It's a bit too late, now. Recently, though, I've done a few things to make the place a bit more personalized. I found a deal on Shutterfly.com about a month ago offering fifty free 4x6 photo prints just for creating a free account. Why not? I sifted through the thousands of pictures I've taken over the last few years and chose my favorites that I'd like to have around my apartment. That's a daunting task, let me tell you. When you have that many photos, it's difficult to try to narrow down fifty that you really want. You end up having debates with yourself about the merits of one picture over another and why it deserves to be one of the chosen few. Or, at least, I did... maybe that's weird. PS - if you need a lot of frames in a hurry but don't want to spend too much money, hit up your local Goodwill or Salvation Army. I got six good frames for $10. I also went last week and bought my first Christmas tree now that I'm living on my own. I didn't want to get a live one, partly because of the hassle and partly because it's kind of a waste of an entire tree (no offense to you live-tree lovers out there). So I went to Target and found the perfect one. It was love at first sight, really. The perfect little 4-ft Norway Spruce pre-lit with clear lights. I searched for the corresponding box under the display, but alas! There were no more of this specific tree, though there were plenty of other types. That must mean that the tree I chose was the best tree there, of course. I asked the Target employee standing nearby if he could check in the back to see if there were any extras. After awhile he came back and said that there weren't any more at that store, and the other local Target was out as well. To make a long story short, two more visits to different targets, 15 minutes on hold with a Target employee, and a day later, I had my tree. 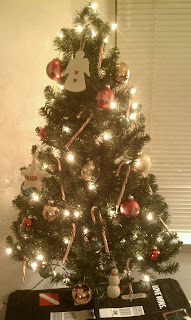 I picked up some ornaments and the obligatory candy canes and came home to set it up. That Christmas tree really spruced* up my apartment. Having that Christmas tree lit up in the evenings and seeing some of the photos in frames around my apartment really have made the place feel a bit more like home. Just that little bit more cozy. I still haven't hung anything on the walls, but at this point it's kind of pointless anyway. In any case, I really enjoy walking around the apartment and seeing the random photo of my friends or a beautiful place I visited. And just in time for Christmas, too. Wherever you are in the world, I hope you've made an effort to make it feel like home. There's nothing like it. Haha, hope you have a Merry Christmas! I had no idea fake trees were labeled the type of tree their imitating.